Papaya is a fruit that is rich in antioxidants. Not just that, the enzyme called papain which is prominent in Papaya helps renew skin and also removes impurities from it. It is filled with the goodness of Vitamin B, C, flavonoids, and lots of fibre, vitamins and minerals. Do you not absolutely love to eat a slice of a nice and ripe papaya, full of goodness? Well, next time around, save a piece for your skin too, because papaya applied on the skin can do wonders. It is a component of many a creams and shampoos. However, rather than picking up a papaya rich product off the shelf, we tell you how you can concoct homemade remedies using papaya that can whiten your skin. If you have a papaya that is refusing to ripen, then this is the best way to use it. 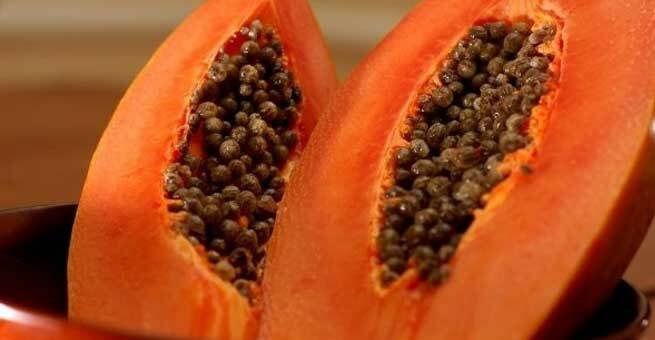 Take a few slices of the papaya and peel and deseed it. Add a teaspoon of yoghurt to it and a teaspoon of honey. Blend this in the mixer to make a paste. Cleanse you face and apply this paste on the skin. Leave for half an hour. Rinse with lukewarm water. Doing this weekly will give you brighter, blemish free skin. The papain in the papaya is great as an exfoliator. It helps get rid of dead cells on the skin, making it an excellent choice as a scrub ingredient. Grate about a slice of a papaya into a bowl. Add a teaspoon of honey to it. Add some sugar into this mixture. You can choose white or brown sugar as per availability. Mix it into a fine paste. Wash your face well and use this scrub on damp face in circular motions. Focus on blemishes and tanned regions. Also work the scrub on any blackheads or whiteheads that you might have. Leave for five minutes and rinse. End result is a brighter and blackhead free skin. If you want a real quick fix solution for brighter skin, simply rub the inner peel of the papaya on damp skin. It will get rid of dead cells and also leave your skin bright and supple. This one is with ripe papayas. Take a small piece of papaya and mash it well. Add to this a tsp of honey and a tsp of lemon juice. Mix well into a paste. If you want, you can add some egg white to it. Now apply this mask on cleansed face and leave it on for 20 minutes. Wash it with lukewarm water and pat dry. Simply blend a slice of papaya with two tsp of whole oats in a mixer. Wash your face clean. Scrub this mixture gently on the face. Both papaya and oats are lightening ingredients. If you can tolerate the smell, you can even add some buttermilk in the mix. Leave it on for twenty minutes. Wipe away with a wet washcloth. Repeat twice a month for best results.